Reception and Y1 boys had transformed into Arctic animals, dressed in white they sported animal headdresses which they had decorated themselves. There were “tricky hop, hop, hopping hares”, “frisky fast foxes”, fish and whales, “wallowing walruses” and “slippery seals”, brought to life through movements as they were hunted by the snow bear. 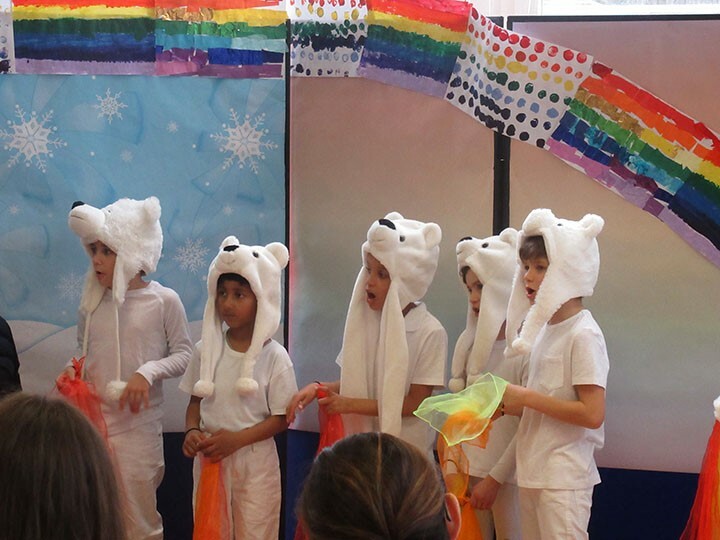 Henry, Y2, was the title character, a polar bear whose love of rainbows tempts him to make a very unwise wish. His expertise as a hunter is undone when he takes on the colours he admires so much. But he wished anyway. Reception boys covered him in colours and Y1 joined him in a dance of celebration as Snow Bear became Rainbow Bear. “We can see you coming” sang the animals and so could the hunters and ringmasters who caught and imprisoned the Rainbow Bear. They carried him off and sold tickets for everyone to come and see him. “Roll up, roll up, get your tickets here, come and see the Rainbow Bear,” they said, because we love you Mister Rainbow Bear. But “through the bars of your cage” a boy, Danyal, notices his “sad lonely eyes” and encourages him to wish on rainbow again and return to his natural state. All the boys worked so hard to learn the songs whose tricky lyrics were based on Michael Morpurgo’s beautiful descriptive prose. They remembered all their cues and waved their rainbow scarves enthusiastically every time rainbow appeared. It has been hard work and has taken over our lives for the past couple of weeks but the delight that the boys show when singing to the family members watching, the courage some of them found to speak their lines and the focus needed to work as a group makes it all worth it. They are sharing a story, not as passive listeners but as active participants, something that is deep rooted in the human experience and brings communities together. We are proud of them. Well done Pre-prep!